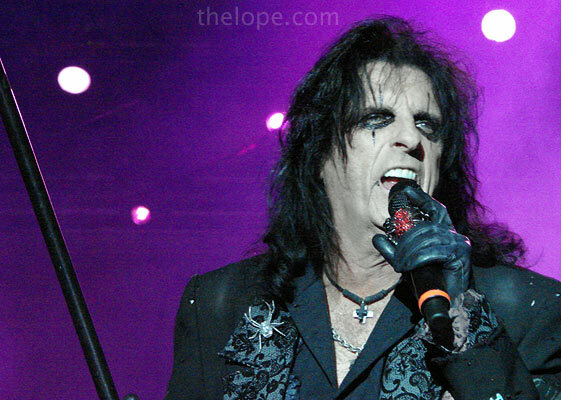 Alice Cooper will perform Friday, September 12 at the fair. There's even a willowy dancing woman. Cooper's daughter, Calico Cooper (right), dances and acts in the show. She even does some of the choreography. Her moves remind me of a macabre version of Kate Bush's 1981 performance at London's Hammersmith Odeon. 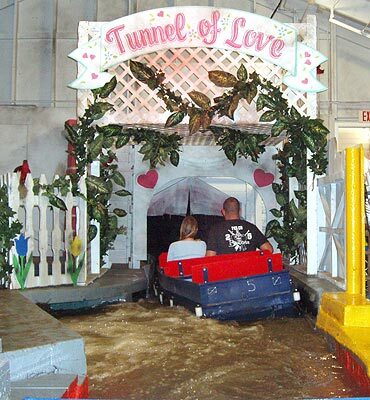 On to other stuff - The first weekend of the fair is over, and I had time to check on some of my perennial favorite attractions. Here they are, with updated information. 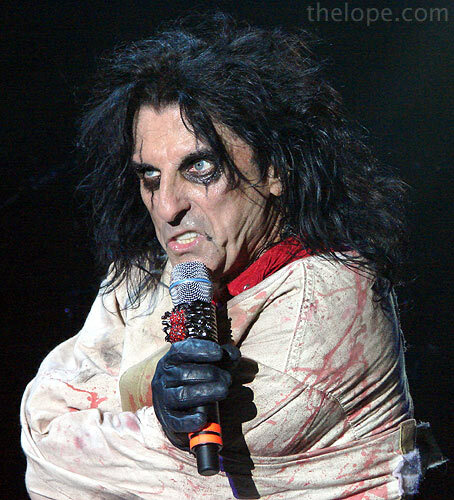 If you think Alice Cooper is evil, your suspicions are misplaced. The most delightfully demented looking thing is under the grandstands, not facing them. 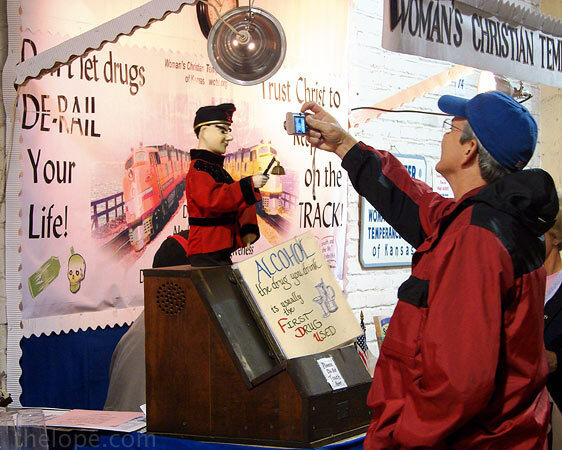 The Women's Christian Temperance Union (WCTU) has two of these automated page-turners, and this year they brought the one in the red suit. Its cracked and ancient latex face looks none the worse for wear than when it was last here, two years ago. 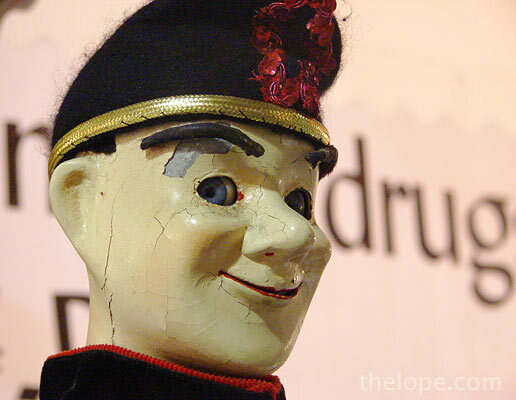 These jittery automations were made by the Character Display Company of Chicago; the WCTU says they date from about 1935 and that one has been at the fair every year since. 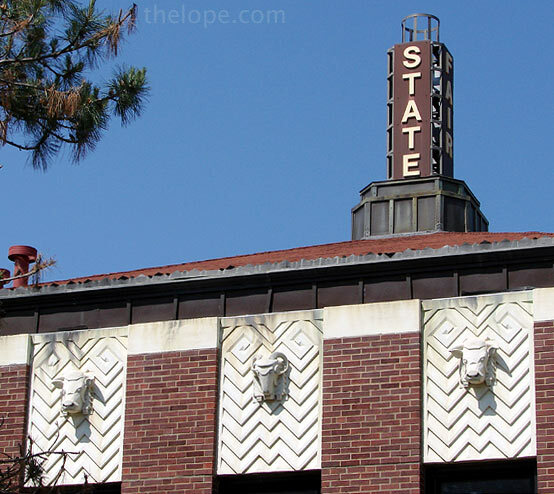 Read all about these twilight zonish beauties, in Twilight Zones of the State Fair and Something Sober This Way Comes. Here's a movie of it from two years ago. It's been worked on since, and its motor is slower. And here's a video from yesterday. You can see the obviously slower speed. By the way, I mean no slight by calling him evil; even the folks working the booth often acknowledge that passers-by say just that. Of course, while commenting they're looking at his book about alcohol and drug abuse, so his creepy charm works and the automated messenger is successful. 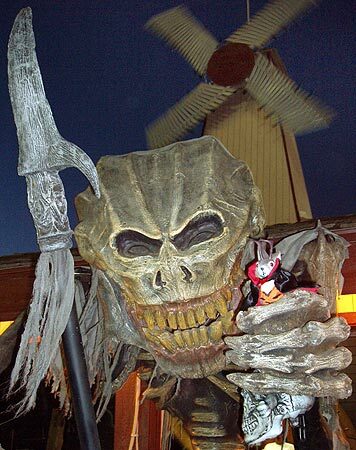 Ye Old Mill is thriving this year. 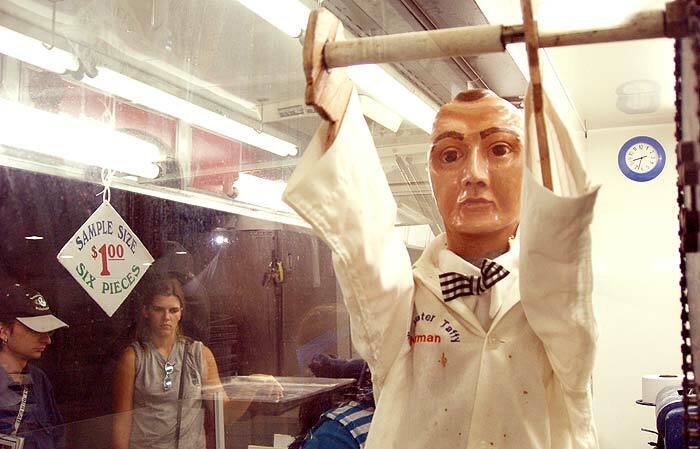 Sadly, the huge and horrific automated barker that's been outside these last few years is gone, a victim of persistent technical failure (2005 photo). 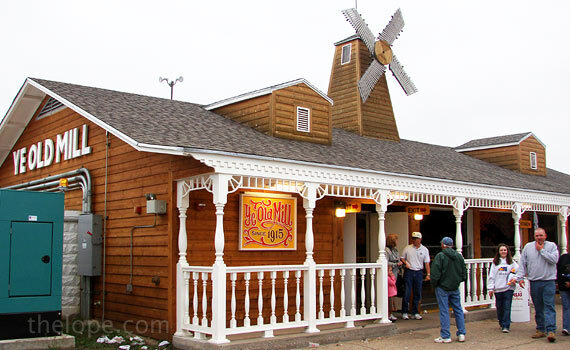 The mill is still a great value at $3. Where else can you float through a 1915 vintage ride that's had minimal alterations? Nowhere; that's where. 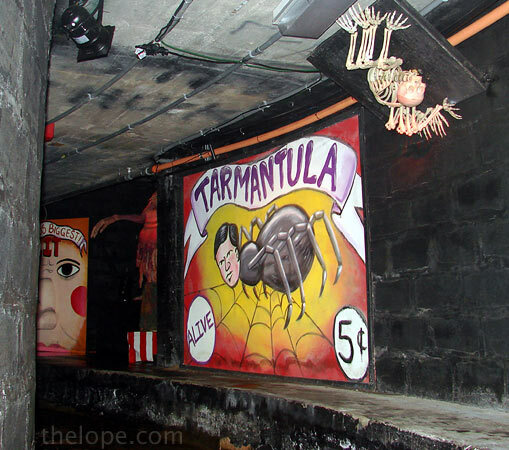 It has no updates since last year and is still formatted as an ironic Tunnel of Love with a sideshow/horror atmosphere inside. 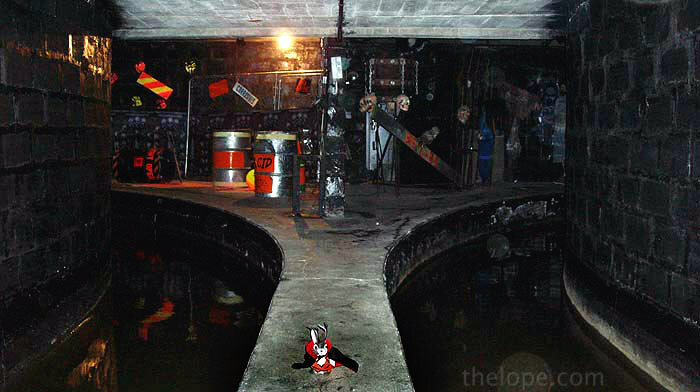 We were given a tour of the inner working of the Ye Old Mill in 2005, see it in Ye Old Mill. And see more of the place in Bride of Ye Old Mill. 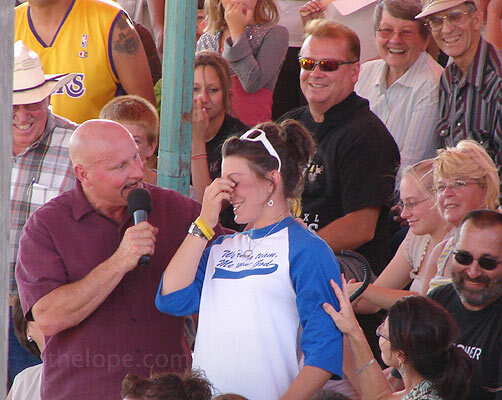 There are lots of free shows at the fair, but my favorite from the last few years is Ron Diamond the hypnotist, who is back this year for three shows most days. Here he is yesterday, warming up the audience. In this photo from last year, he has convinced several young men that they are the Village People. Diamond told us he is contracted to do the fair through next year. 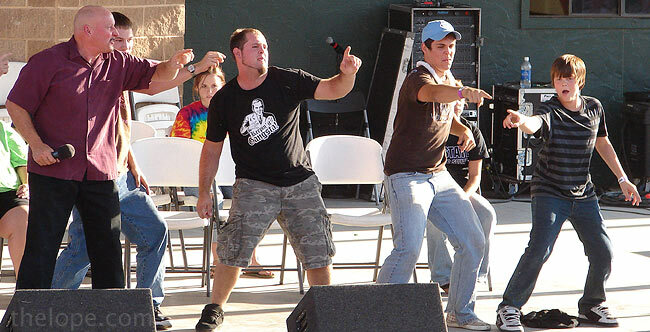 Often, someone in the audience is accidentally hypnotized. This young lady is coming out of it. 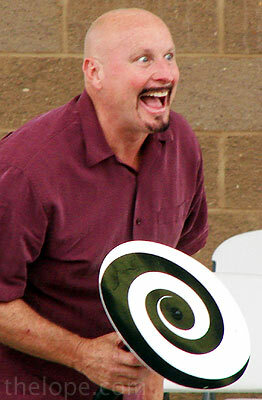 See more of Ron Diamond in Pigs and Tigers and Hypno-Monkeys. 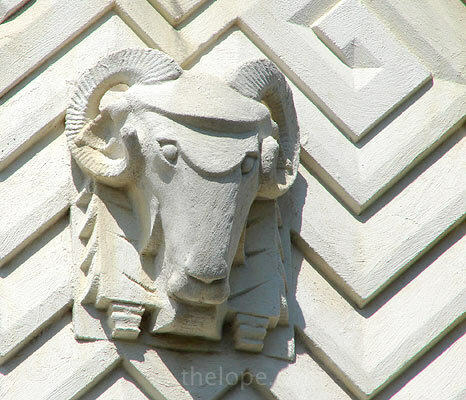 I always stop to admire the art deco 4-H Encampment Building, of which these are details. The 4-H entomology and geology displays are a mini-museum of what can be found in Kansas. I'm continually amazed at what these young people's hard work turns up. The building is tucked away in the northwest corner of the fairgrounds and doesn't get near a much traffic as I think displays of this calibre should bring. 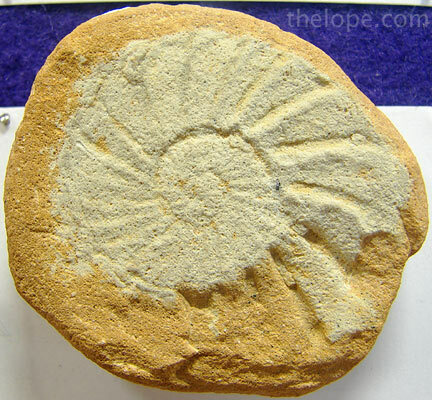 This cephalopod fossil (collignonaceras) from Russell County is displayed by Katherine Vesper of McPherson County. 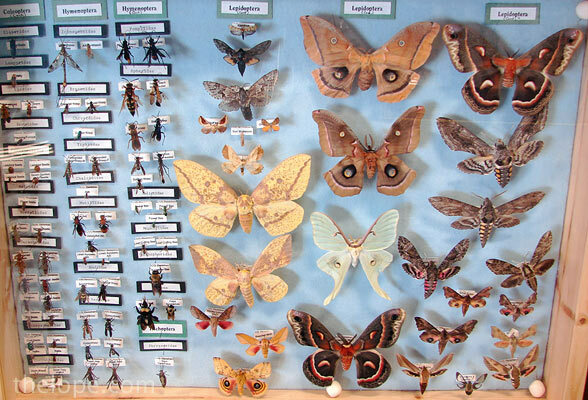 This entomology entry is by Lisa Sholz of Denton. 'll try to publish more pictures from this exhibit later in the week, but for now, see more such stuff from 2007 in Bugs and Rocks and Fun with Animals at the Fair. 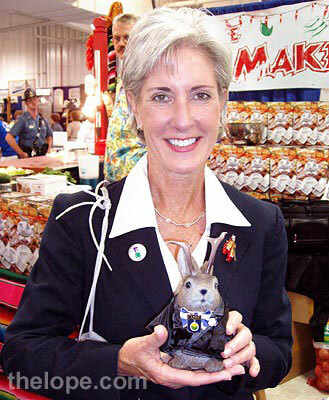 Wednesday is Governor's Day at the fair, so you might get to meet Kathleen Sebelius, as Ace did in 2006 (above). Check the fair schedule for where she'll be. 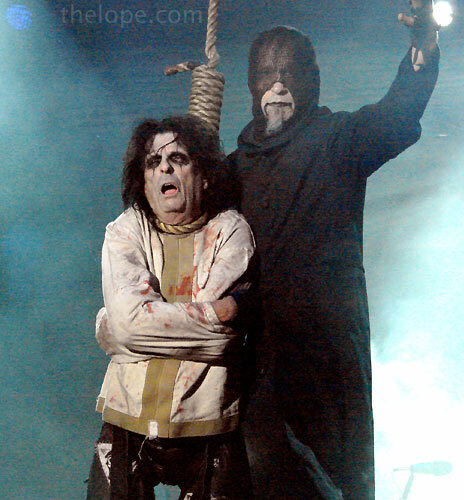 We included this picture with a bunch of others in The Governor, the Jackalope and More Fair Stuff. Norman the Taffy Puller works where has the last few years, across from the front of the Meadowlark Building. Read of his history in Norman the Taffy Puller. We'll post more fair stuff later this week. Thanks! Loved the photos and detailed information on the exhibits (along with the links to previous years). I'm surprised you didn't get at least a picture of the spray paint artist. He was right down the road from the taffy-puller, and did amazing work! Did some really fantastical paintings in under 10 minutes using just spray paint, a lighter, and some scrap newspaper.. Anonymous, Enrique Morales is featured in the next post. We are seeking the cooperation of the Public to put a stop to Enrique Morales and Adriana Hernandez.Mr. Morales is in violation of copyright infringement laws for the use of Cosmo Music Mix I & Cosmo Music Mix II and is possibly using "NO VIDEO TAPING" signs to avoid further prosecution.Last whereabouts South Beach,FL. If you have any information regarding this music please contact legal Services & Investigations @ 214-407-4604 or email legalpisrv@ymail.com-ALL CALLS/EMAILS WILL BE KEPT PRIVATE & CONFIDENTIAL.